COULD LANDRY JONES EMERGE FROM 2013 QUARTERBACK CLASS? At times during his Oklahoma career, Landry Jones could be considered the third best quarterback in the Sooner’s signal caller’s meeting room. This wasn’t because of the gaudy numbers Jones put up over his 50 games as the Sooners staring quarterback. It was because his position coach was Josh Heupel, the 2000 Heisman runner-up, and Sam Bradford, who captured the 2008 Heisman Trophy during Jones’ redshirt season, surrounded the now 2013 draft prospect. Jones playing time began in 2009 when Bradford suffered a shoulder injury during the Red River Shootout against Texas. From there, Jones shattered school records and leaves Norman as the Big 12’s all-time leading passer in yards (16,646) and attempts (2,135). With pre-draft workouts underway, Jones has moved on to another place that is rich in developing quarterbacks. George Whitfield, known as a quarterback guru, is working Jones out in southern California and has a recent history with college quarterbacks preparing for the draft. “George is a great quarterback coach, has had a lot of success in the past about training guys and getting them ready for the draft, including the last two No. 1 picks” Jones said. In late January, Jones attended the 2013 Senior Bowl where he was exposed to some other intricacies of the quarterback position that he will have to adapt to at the next level. NFL Network Analyst Mike Mayock said Jones is a hard prospect to qualify, when some games he looks like a potential first round pick and others where he grades out as a fifth round projection. “When I look at Landry Jones, I’ve got him as my number five quarterback, and I’m holding my breath on that one a little bit,” Mayock said. Mayock said he is still searching throughout the entire 2013 quarterback class for that guy who belongs in the same sentence as the rookie signal callers who took the NFL by storm last season. Where the 2013 quarterback will rank is to be determined and Jones offered his assessment of a group he hopes to find himself at the top of. Kawann Short’s introduction to many sports fans around the state of Indiana did not come on the gridiron. As a junior forward on East Chicago Central’s 2007 State Championship basketball squad, the nimble, 300-pound Short poured in 20 points and 10 rebounds helping the Cardinals to an 87-83 Class 4A Title over the Eric Gordon-led North Central Panthers. Short’s future in sports would transfer back over to the football field and the former Purdue defensive tackle was back in Indianapolis this past week for the NFL Combine. 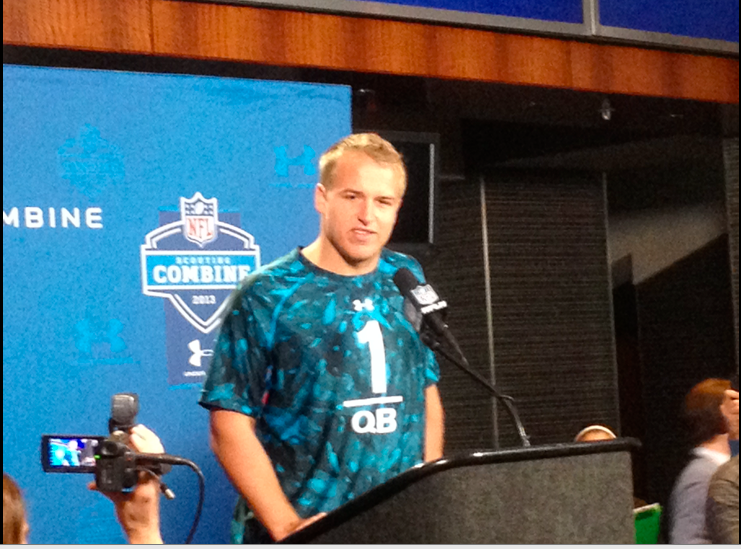 On Saturday, Short weight in at 299 pounds which is a number that he said he hasn’t seen since junior high. “I feel more versatile now,” Short said of the weight loss. “My conditioning is way better than it used to be. I can play a lot more, I can run a lot more, and I can hustle. So that was the main thing I was trying to do, just find a weight I was comfortable at, and keep going at that. As a four-year starter on the interior of the Boilermakers defensive line, Short was a force with 49 tackles for loss and 19.5 sacks. Following the 2012 season, Short participated in the 2013 Senior Bowl and left with one focus in trying to establish himself as a first-round pick come April. “My whole goal going into the Senior Bowl was just being consistent,” Short said. A hamstring injury held Short out of the drills at this week’s combine but he is expected to be a full participant at Purdue’s Pro Day on March 25. Purdue has had a recent history of producing dominant defensive linemen that have gone on to be productive in the NFL. Short is looking to continue that trend and took another step in that direction with a productive week in the city where his name gained recognition a little less than six years ago. One of the last images of Jim Harbaugh for NFL fans this past season was his pleading for a late holding call in Super Bowl XLVII. Harbaugh didn’t get his way, and his 49ers fell to Baltimore, 34-31. A week after that, the surroundings at the AT&T National Pebble Beach Pro-Am likely were no balm for the wound inflicted by the loss. The year-round nature of the NFL offers very little time ever to decompress. Bill Polian once estimated he only had about five free weekends annually. The rest were devoted to his job. The schedule for coaches is about the same. 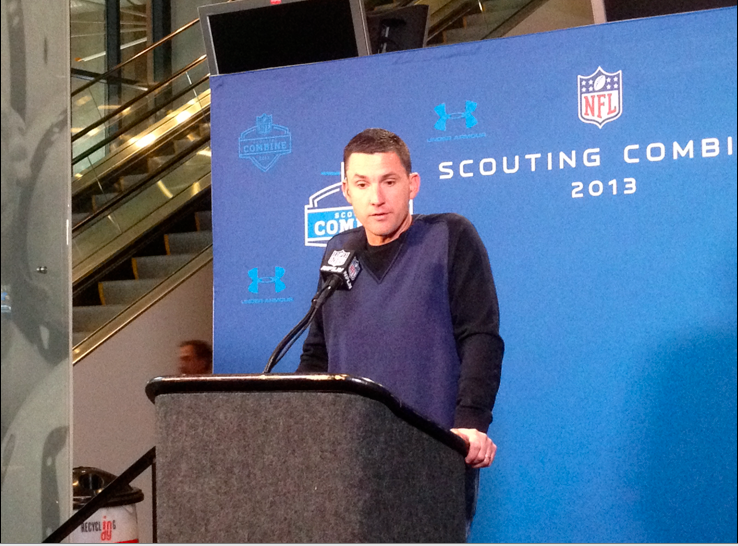 “(I’ve) got the paw in the ground, scratching, ready to go,” said Harbaugh yesterday at the combine. The annual event is held in the stadium where his name is splashed on the eastside façade with others in the Colts’ Ring of Honor. A one-man verbal pep rally with Indianapolis from 1994-97, Harbaugh is a touch more measured with a whistle in his mouth but anytime he speaks, it is appointment listening. Harbaugh was paired against his brother, John, in the Super Bowl and said the two have spoken since the game. Losing is tough for all players, and Harbaugh’s competitive streak runs deeply. He said losing to his brother did not make the setback easier and that the two share less information as their careers have progressed. Harbaugh was a first-round pick from Michigan. Now, he is here to help re-stock the San Francisco roster if combine hopefuls measure up. He said he does not possess the keenest ability to sit in a short visit with a player and truly get to know the person. He says the body of work a prospect leaves behind at his school is a better indicator, along with those who worked around him. Teams can grill players in the interview process. The best advice from league players to those hopeful of joining the NFL is to be yourself. Harbaugh is direct and has no tolerance for someone being a tad less than honest. 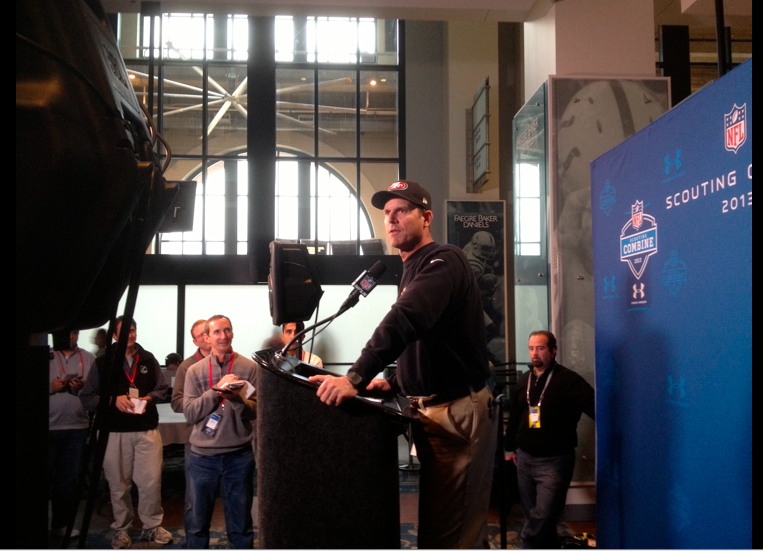 “Somebody that’s not truthful, that’s big, to me,” said Harbaugh. “I’m a big fan of the Judge Judy show and when you lie in Judge Judy’s courtroom, it’s over. Your credibility is completely lost. You have no chance of winning that case. I learned that from her. Harbaugh’s 49ers will host the Colts in 2013, pitting him against quarterback Andrew Luck. Harbaugh landed Luck at Stanford and tutored him early in the quarterback’s career. Harbaugh said he now will have to look at Luck in a bit different way now that they will be on opposing sides of the field for the first time. During his nine seasons in the AFC South with the Tennessee Titans, Jeff Fishers got well acquainted with the Indianapolis Colts. 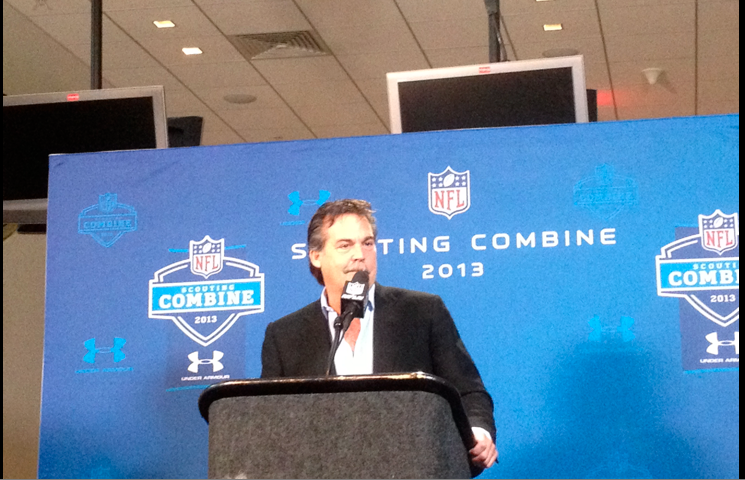 Rams head coach Jeff Fisher meets with the media on Friday afternoon at the NFL Combine in Indianapolis. Fisher and his staff will return to Indianapolis later in 2013 for a regular season matchup with the Colts. He led the Titans to four playoff appearances while becoming the most consistent threat to the Colts reign on the division. Fisher will return to Indianapolis this 2013, this time as the headman in charge of the St. Louis Rams. There is continuity in St. Louis and that has Fisher intrigued heading into the spring. “I’m probably equally excited about the offseason at the facility _ the offseason program,” Fisher said. “The fact that both sides of the ball are staying in the same system. We’re gonna improve our young players. So I’d like to think by the end of the offseason that we’re a better team than we were when we finished (2012). The Rams are coming off a 7-8-1 record in 2012 but did win four of their final six games, falling 2.5 games out of a playoff berth. One bright spot St. Louis can point to last year was compiling a 1-0-1 record against the NFC Champion San Francisco 49ers. Quarterback Sam Bradford will be entering his fourth season as the Rams starting signal caller. Last year, Bradford threw for a career-best 3,702 yards and 21 touchdowns. The NFC West placed two teams into the playoffs last season with the Rams striving to get themselves into a picture with a leader that has coaching experience in January. “If we’re doing our job _ we identify strengths and weaknesses in not only the younger players but all of our players _ and you have to address those things during the offseason,” Fisher said. The 2013 campaign marks Marvin Lewis’ 11th as the head football coach of the Cincinnati Bengals. After back-to-back playoff appearance, Lewis has the Bengals on the cusp of a deep playoff run. The last two seasons the Bengals have dropped road Wild Card contests to the Houston Texans. Heading into the offseason, Lewis is looking to get over the hump of four Wild Card defeats during his 10 seasons with Cincinnati. 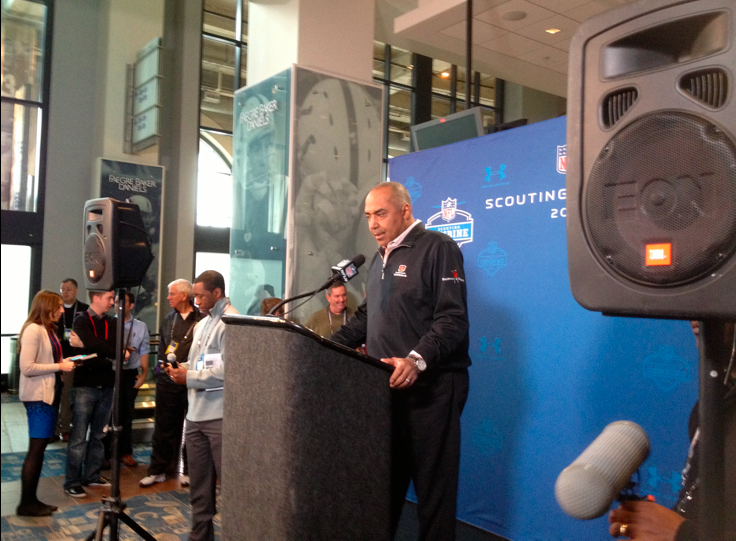 Bengals head coach Marvin Lewis addresses the media on Friday morning. Lewis and the Bengals will welcome the Colts for a regular season meeting next year. “We’ve had opportunities and haven’t played as well in those games. I didn’t think that would be an issue for us,” Lewis said of past playoff disappointments. Third-year starting quarterback Andy Dalton showed steady improvement this past year, improving in virtually every statistical category. Dalton has transformed from a second-round draft pick into a starting NFL quarterback from day one and has led his team to playoff berths each year..
“(Dalton) continued to grow and become the leader of the team. That’s what I challenged him throughout the year to do and he did a great job of responding to that,” Dalton said. Young talent for the Bengals extends to both sides of the ball and at virtually every position. “I have a lot of disappointing losses. I remember them more than the wins,” Lewis said.